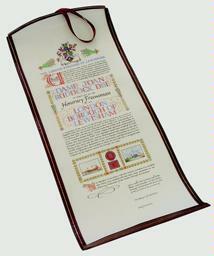 Shaw & Sons offer a wide variety of hand illuminated scrolls, for such occasions as the conferment of the Honorary Freedom on an individual, or the Freedom of Entry granted to a regiment or other service body. Documents are also produced in connection with the creation of Honorary Alderman, the presentation of messages of congratulations or thanks and certificates. All scrolls are produced on vellum by skilled artists using traditional methods. This page gives examples of some of our work in a number of different styles. The styles each carry a reference number, but this does not limit your choice. Most documents are illuminated, employing the tasteful use of colour and gold and can be presented in a variety of ways - for example, mounted and framed, placed in a leather backing and/or in a casket, or mounted in a leather portfolio. Most scrolls can be in either "portrait" (upright) or "landscape" format and may be of any size, although those inserted into a backing and casket may be subject to limitations. A fully illuminated scroll including Armorial bearings in full colour, regimental badges, battle honours, scene, etc. 15" x 9" or 18" x 12"
Scrolls illuminated in three margins, including Arms, scenes, etc. 24" x 8" or 22" x 9"
Similar in style to A2, including Arms, but without scenes, and with illumination in top and left margins. Fully illuminated scroll, including Armorial bearings, regimental insignia, battle honours or other decoration. 18" x 8" or 24" x 9"
Scroll including Armorial bearings, but without a border; initial letters and relevant parts of text illuminated. A landscape-style scroll layout, with decorative border and Arms in full colour. Scroll designed to incorporate Arms in full colour, plus a number of armorial bearings, badges, etc., in left hand margin. Portrait or landscape type scroll with heavily illuminated border on all sides, incorporating Arms in full colour and other pictorial references to recipient's interests. Scroll with Armorial bearings in full colour, lightly illuminated all round border, plus scene or other illustration. Similar to style A10, including Arms, but without additional illustrations. Simple modern design, appropriately illuminated text only, without border. Landscape style scroll, incorporating Armorial bearings in full colour, plus regimental badge or other illustration, either with or without lightly illuminated border. Scroll including Arms in full colour, a lightly illuminated all-round border, plus regimental insignia, etc. ; appropriate parts of text illuminated. Scroll including full colour Arms and illustrated border, with badges, scenes, etc., in left-hand margin and at foot. Certificate style scroll, with Arms at head, and appropriately illuminated text. A17 Scroll including full colour Arms and illustrated border, with badges, scenes, etc., in left-hand margin and at foot. Complemented by ribbon detail. A portfolio style scroll, hand illuminated, bound in red leather with gold tooling. 24” x 9” Hand illuminated scroll, bound in burgundy leather with gold tooling.